Don't even pretend that you're not in love with the 70s. The disco music, the dance floors, the babes, and of course the Afro. And what about the gnarly threads? Seriously. How could you possibly turn down a hunk with that little peek-a-boo of chest from a half-buttoned shirt? The shirts with super pointy lapels, whether coupled with suits or some cool bell-bottoms, were iconic. Of course if you're planning on getting down on the dance floor, you'll need some of these killer threads yourself. We're talking something groovy, like this Yellow Disco shirt. 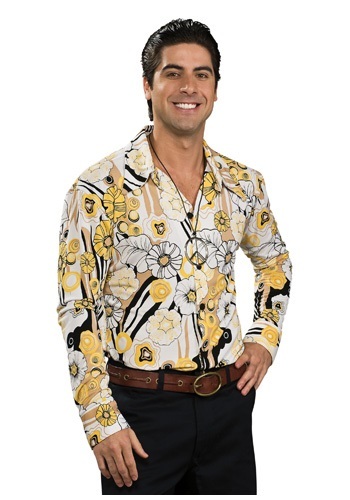 It's long-sleeved and button up with a rad yellow paisley pattern. Add a white jacket, some platforms, and chains and you'll be one sweet stud.